Over in my shop Sweet! we sell little paper sacks in kraft and white. They work great to send through the printer to make custom little favor bags. You can also print on regular lunch sacks, however they are a little more difficult because of the gusset on the sides. 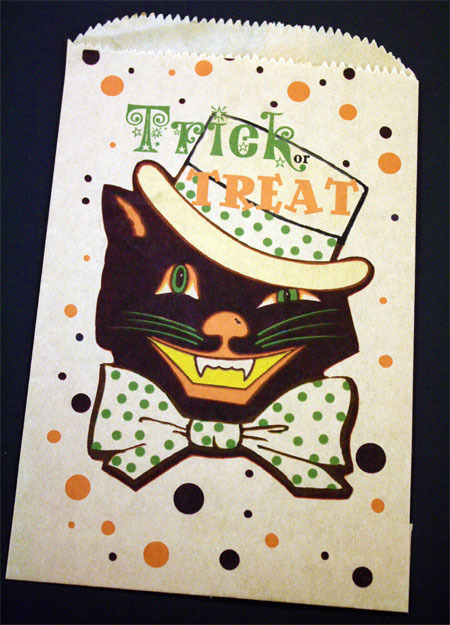 I used the kraft sacks to make these vintage looking trick or treat favor bags. First, download the printable. Place the side you want printed face down in the printer tray with bottom of sack going in first. On my printer I can choose 5 X 8 postcard on the printing menu. I then move the bar over on the printing tray until it is next to the edge of the sacks, and print away. If this doesn’t work for your printer, print the download on a place piece of copy paper. This shows you the placement on a regular piece of paper and you can tape the sack onto the paper with blue painter’s tape and run the paper through the printer. For a picture tutorial on this technique please go here. If you are using these sacks for cookies or baked goods, the fat can sometimes discolor the sacks. If this is the case, you can line the paper sacks with glassine bags. They fit just inside the paper sacks and will keep the paper sacks nice. New wall art to tell stories. of this collection specially designed for the nursery and baby! Adorable! Love your shop, too! I didn't realize you owned that shop! I spent over an hour looking at all the fun stuff a while back, and ordered some things just because I was so excited about the prices! Then my order came so quickly...I wanted to thank someone. So THANKS! such classic little treat sacks, I love them!